Some tips about planning your travel itinerary if you’re thinking of a trip up to Siem Reap to see the Angkor temples. The high point, perhaps the entire point, of a first trip to Siem Reap is the visit to the Angkor Archeological Park. The park which sprawls over more than 400 square meters just outside of Siem Reap city encompasses dozens of temple ruins representing what remains of the Angkorian-era capitals of the ancient Khmer Empire. You must have a temple itinerary and there are many that are available on the Internet. If you can only visit two temples, the ones to visit are Angkor Wat and Bayon. 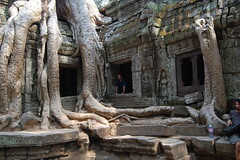 You might also want to check out SEAArch’s Adventures in Angkor Series.